This morning I taught, as I do every Thursday at 9am, a Vertical Pilates class here at Parrot Cay. It's always funny to me when guests come in and I tell them to get a thin sticky yoga mat instead of the thicker Pilates mats and they say, "Oh, we're standing for the whole class?" as if "Vertical" meant something else. 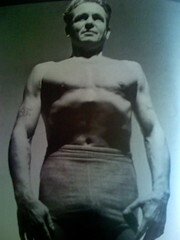 I reminded my 12 guests this morning that Joseph Pilates developed Contrology exercises while interned as an enemy alien by the British during WWI. That in the prison camp there was limited space, limited time, and thousands of German men who were there for years (the British didn't release the Germans until Germany made its first reparations payment, which took a little while). These were men of all backgrounds who were separated from their families, and Britain was being ravaged by the influenza epidemic and the war. This was exercise born of the need to survive physically and mentally! Joseph Pilates taught a lot of standing exercises from basic jumping jacks and squats to lunges, single leg squats, and martial arts maneuvers. There were push ups, side planks, walking elephants and cats, jogging in place, and many other exercises that many people do not associate with Pilates. Put them all together for an hour and you have a pretty intense weight bearing workout for the whole body. People's legs were shaking! They couldn't hold their arms up any longer! They felt the work.